Learn about Aerospace Metal Joining from Metglas®, Inc. Components with rigid dimensional tolerances and high strength / stiffness-to-weight ratios are needed to handle the stresses inherent in aerospace applications. Metglas® Brazing Foils (MBF’s) from Metglas, Inc. is produced as thin as 25 µm (1 mil) to satisfy these requirements. It gives consistently reliable and strong joints. 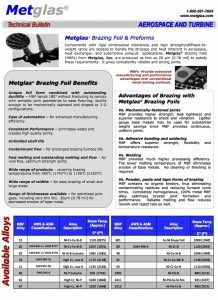 Metglas® High Purity Brazing Alloy can meet todays demanding industrial, automotive and aerospace brazing applications. These stationary components are set between rotating blade assemblies in the compressor section of jet turbine engines. They guide airflow between blade stages, critical to increased engine efficiency. 12 to 15 stators may be used in an engine, with each stator requiring attachment of 100+ airfoil vanes to a shroud ring. High strength, corrosion resistant, economical joints with uniform gap are required. Brazing powder and powder-binder composites may be used, but these leave contaminating residues and promote joint shrinkage and brazing rejects. MBF’s is simply tack welded into place on the shroud ring and the vanes are assembled and fixtured with an expansion ring for brazing. Clean, nonporous and strong joints are formed upon brazing. The feltmetal seals are used in the rotating blade assemblies of jet turbine engines. They are designed to wear down from abrasion by rotating blades and then be periodically replaced. Twenty or more of these seals may be used in an engine. Each seal is brazed to the backing ring, requires uniform joint gap and minimum wicking. If excessive wicking occurs, when powder brazing filler metals are used then the feltmetal will damage the more complex and costly blade assembly. Metglas Brazing Foils (MBF’s) are sandwiched between the backing ring and feltmetal, fixtured with an expansion ring, and brazed. Ultra-thin, custom-designed MBF’s meet the specified dimensional tolerances to avoid excessive wicking by simplifing the process and eliminating rejects. Honeycomb structural panels are widely used in aerospace applications since they offer exceptional strength/stiffness-to-weight ratio. Acoustic turbine tailpipes, exhaust plugs, cones, nozzles, and fan ducts are often brazed as honeycombs. For acoustic or sound attenuation structures, the brazing filler alloy must flow off the honeycomb surfaces to form fillets at all the junctions without clogging the perforations, which are needed for sound absorption. Residues left by other conventional powder containing brazing filler metal clog the perforations due to inferior flow, leading to joint rejects. By tack welding the Metglas Brazing Foils (MBF’s) to the face sheets, capillary action draws the melted brazing foil to the thin edges of the honeycomb structure, while keeping it out of the perforations. Joint strength is improved because the foil acts as a spacer to maintain an optimum joint gap. Filler metal flows only in necessary contact area. Metglas Brazing Foils (MBF’s) are suitable for use in many other aerospace applications. Honeycombs are used extensively in space vehicles, engine seals, thrust reverse components, fire walls, and engine tail feathers. Ancillary engine components such as nacelles, heat exchangers, honeycomb seals, wear pads, seal shroud segments, diffusers, discs, corrugated interior hollow vanes, doublers, stiffeners and struts for frames are also widely produced using these foils.